What is one plumbing fixture that you can’t live without? The toilet is probably what most people would answer. However, a toilet sees a lot of use throughout its lifetime. Replacing an older toilet with a new one can be a simple and effective way to improve the energy efficiency and function of your bathroom. Many homeowners focus on the aesthetic and comfort of a toilet when purchasing a new fixture and forget to consider the most important factor: the flush. Modern toilets offer you the opportunity to customize your flushing experience in order to improve the performance of your restroom. If you are in the market for a new toilet, look for these flushing features to ensure you purchase the toilet best suited to meet your needs. Once you press the handle of your toilet down, the water inside the tank must funnel into the bowl to complete the flush. The rate at which water leaves your toilet’s tank can affect the efficiency of the flush. Older toilets are equipped with flappers. These rubber stoppers cover the drainage hole in the toilet’s tank. When the handle is depressed, the flapper lifts up and releases water. 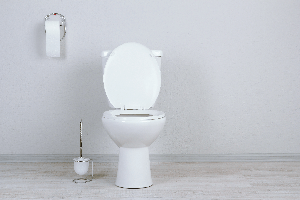 If you want a more efficient and powerful flush, look for a new toilet with a tower flush valve instead of a flapper. Tower flush valves allow water to exit the tank from 360 degrees, resulting in a faster and more powerful flush. Also, invest in a toilet with a larger flush valve if you want to increase the velocity of your flushes in the future. You have two types of flushing systems that toilets can utilize to empty waste. Most residential homes are equipped with gravity flushing systems. Toilets using a gravity system rely on the pull of gravity to move water from the tank and into the bowl. Although they are common, gravity systems are not as powerful as pressure-assisted flush systems. You have probably experienced the high-powered flush of a pressure-assisted flushing system in a restaurant or retail store. These systems use a mixture of water and pressurized air to complete each flush. Because the pressurized air helps to increase the velocity of the water during a flush, you require less water to remove waste. A pressure-assisted toilet needs a smaller tank, which gives you more room in your bathroom for other useful fixtures. You will also be able to reduce the amount of water you utilize each time you flush by investing in a pressure-assisted toilet, but you need to be prepared for a noisy flush, especially in the middle of the night. Another important feature to look for when you are investing in a new toilet is a dual flush. A dual flush allows you to control the volume of water you utilize during each flush. The removal of liquid waste doesn’t require as much water as the removal of solid waste from a toilet bowl. Because of this, you can press one button to release a lower volume of water for liquid wastes and a separate button that will release a higher volume of water when you need to flush solid waste down. Controlling your flushes with a dual flush system allows you to reduce your water consumption without sacrificing the function of your toilet. The right toilet can significantly improve the function and aesthetic of your bathroom. Choosing a toilet with the right flush features will ensure that you are able to remove waste efficiently while minimizing your water usage over time. Contact the knowledgeable professionals at Rapid First Plumbing for more information on how specialty flushing systems and toilets can benefit your family.